It is the forum for redressing grievances of people affected by environmental clearances, given by the government, to dams, infrastructure projects, mines and industrial activities. But a visit to the office of the National Environment Appellate Authority (neaa) at Bhikaji Cama Place, Delhi, would make one think one got the address wrong. There is no board to indicate the office. Nor is there any activity in the office seen in other courts and consumer forums. Set up 11 years ago, the neaa is without a chairperson or vice-chairperson and is understaffed. Former Supreme Court judge, Justice N Venkatachala, was its first chairperson. He retired in 2000 and the post has remained vacant since. The vice-chairperson's post fell vacant in 2006.Three technical members, a court master, a section officer and a few peons comprise the neaa staff. The appeals filed in neaa are heard by three retired bureaucrats and usually dismissed on technical grounds such as delay in filing appeal. 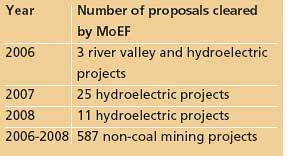 For instance, when the controversial Loharinag Pala hydroelectric project in Uttarkashi, cleared by Union Ministry of Environment and Forests (moef) in 2005, was challenged before the neaa, it did not go into the merits of the appeal. The authority dismissed the appeal on technical grounds saying it was not filed within the stipulated 30-day period. The appellant, Vimal Bhai, of environmental group Matu Jan Sangathan, then moved the Delhi High Court. The court criticized the neaa for being "hyper-technical" in dismissing the appeal--delayed by 23 days--and asked it to decide the case on merit. It also asked the government to appoint a chairperson to head the neaa. This order was passed on September 29, 2005. But the moef is yet to appoint a presiding judge. The high court has now imposed a penalty of Rs 20,000 on the moef and has asked it to appoint a chairperson by mid-May. "The Government of India has rendered it (neaa) ineffective, thus defeating the purpose of the act," Justice S Muralidhar of Delhi high court said in his judgement of February 11, 2009. "The penalty amount may not be much; it is symbolic. The court decision is stern as the government repeatedly disobeyed orders," said Ritwick Dutta, counsel for Vimal Bhai. Dutta said the three technical members of neaa who hear the cases now--two retired forest service officers and one retired administrative service officer--do not have the expertise to handle environmental clearance issues. The term of these members is to expire this month and the court has specifically asked the moef to appoint new members according to the qualifications prescribed in the act. But the act itself is ambiguous about the qualifications, said Rahul Choudhary, Dutta's co-advocate. Asked why appeals are dismissed without going into their merits, an neaa staff member said the problem was with the law because of which cases get dismissed on technical grounds. He said it was not the fault of the technical members. "As per the act even the chairperson cannot admit an appeal filed after the mandated 90-day period from the date of clearance of a project," he said. Vimal Bhai also filed an appeal against the Pala Maneri hydel project on the Bhagirathi, upstream of Uttarkashi. "In this project, the eia documents were not made available to the villagers. But the neaa dismissed this appeal too. It did however pass directions for a cumulative impact assessment for all the projects on the river," Vimal Bhai said. Work on the Pala Maneri project was suspended after environmentalist G D Aggarwal went on an indefinite hunger strike in June 2008. In another case involving mining of iron ore in Goa in 2008 (Ramesh Gauns v moef), all the 102 participants, who attended the public hearing, opposed the project. Even then it was cleared by the moef. When an appeal was filed, the neaa dismissed it saying it was sure the objections were deliberated upon. "The authority is convinced the Expert Appraisal Committee and the ministry duly considered the objections before issuing environmental clearance," the neaa order, dismissing the appeal, said. Regarding the appointment of a chairperson the moef said retired supreme court judge P V Reddi's name was proposed for the chairperson's post in December 2008. He accepted on condition that he be paid a salary equal to that of a sitting supreme court judge. But the act does not provide for such an amount. Justice Muralidhar in his order on February 11 was critical of the government for undertaking "a pointless exercise of trying to persuade retired judges of the Supreme Court and retired chief justices of high courts," without amending the rules on remuneration. Rajneesh Dube, joint secretary, environmental policy and law, in the moef said, "We are in the process of implementing the high court order."